Please go through following step to download/receive an electronic course certificates. a. Course Commencement Certificate: We issue course commencement certificate for all paid courses. You can download course commencement certificate immediately upon the purchase of course subscription. Link to Course Commencement Certificate download can be found on the Introduction Module of each course. b. Course Completion Certificate: Course completion certificate are issued upon successful completion of paid courses. To ensure quality learning at Protrain we have kept certain minimum criteria for course completion. Course completion Criteria are specific to courses. Completion Criteria for each course is available on ‘About the Course and Pricing Tab’ of the course page. 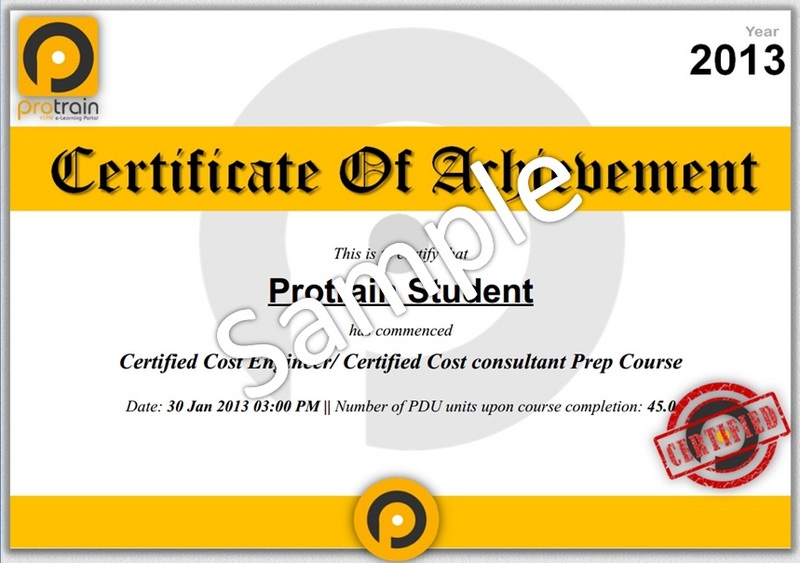 Link to Certificate download shall appear on My Courses>My Certificate menu upon successful completion of the course. We issue PDU certificate for attending our webcasts, viewing recorded webcasts and listening to Podcast. You have to take a small quiz (5 to 10 questions) to download. Link to PDU certificates download are available at respective Webcast and Podcast pages. Note that we issue only electronic course certificates currently.